This is how S.H.I.E.L.D. works. Make a plan. Plan turns to rubbish. Make a new plan. 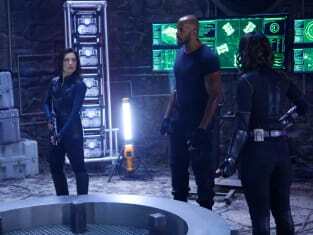 Joey: Okay, so are we rescuing Inhumans or saving Coulson? Or attacking HYDRA? Or is there some kind of combo? Sorry, new guy just trying to understand how this whole S.H.I.E.L.D. thing works. Hunter: This is how S.H.I.E.L.D. works. Make a plan. Plan turns to rubbish. Make a new plan. Oh just to be crystal clear, this is the part where the plan turns to rubbish.